Succeed with your Projects by learning MS Project 2016 Tool. 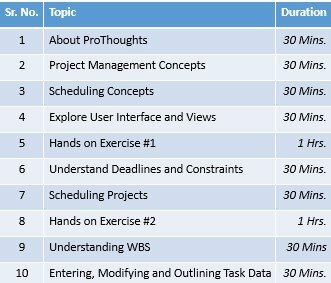 This Microsoft Project 2016 training will provide you with a comprehensive overview of Microsoft Project 2016 functionality and features; and equip you with tools, techniques, and tips to use MS-project 2016 effectively to create and manage optimized project schedule efficiently, manage multiple project schedules and optimize resources across projects. The training will help you address varied performance reporting needs of the stakeholders and always stay in control of the project. It will help you exploit Microsoft project features fully and thus free up your bandwidth to focus more on value-added activities such as ensuring strategic alignment of the project with dynamically changing objectives and environment, minimizing threats and exploiting opportunities etc. and thereby enhancing the probability of managing and delivering complex projects successfully. Manage your work effectively and efficiently and take up additional responsibilities. Allocate and manage project resources. Use proactive alerts, highlights and tips provided by MS-Project effectively and explore various what-if scenarios for informed decision making and schedule optimization. Address diverse reporting needs using – both built-in and custom reports. Use various single and combination views both built-in and custom along with filters, groups and highlights for reporting and performance analysis. Share project information with stakeholders exploiting integration capabilities of MS-Project with various tools such as SharePoint, MS-Excel, MS-Visio etc. Manage multiple projects with a master project plan. 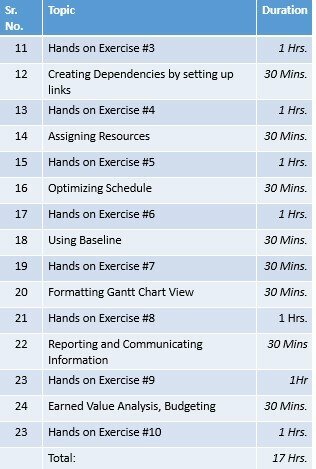 Participants are expected to spend about an hour and a half per session to complete the exercises and have some practice offline. Experience in effectively modeling, scheduling, resourcing, communicating, collaborating on, and delivering projects using Project Pro for Office 365, SharePoint, and SharePoint Online. Ninad has extensive Project and Programme Management experience of over 15+ years managing multiple teams from suppliers, clients etc. What is the code of this certification exam? What is the duration of this exam? The duration of the exam will be two hours and fifteen minutes. What are the focus areas of the exam? The advanced features of Project 2013 will be the focus area for this certification exam. Are there any pre-required certificates or documents required before applying for the exam? There are no prerequisite certificates to be obtained for this course. The exam fee is not included in the course fee and the user will have to pay an exam fee to appear for the exam. Will I get PDUs for appearing in this training? Yes. You will get 16 PDUs for this training. Will I get the Microsoft Project 2016 Certificate after completing this course? On completing the training course, you will get a Course Completion certificate from ProThoughts. The Microsoft Project Professional certificate you will obtain post you appear for the exam. Shall I call it Training as it was more than that. Gave me idea about my gaps in my working and How important it is to get certification. Changed my thinking on communication and documentation. It was really a great learning experience. Ashish is such a wonderful instructor who guided not just for exam preparation but shared lot of experiences because of that it was easy for us to understand.